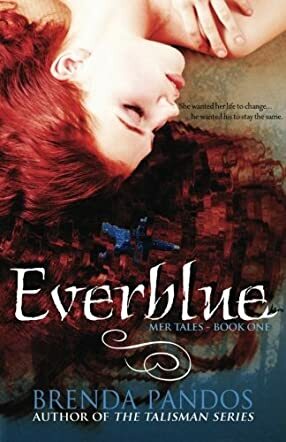 Everblue: Mer Tales #1 by Brenda Pandos is a young adult fantasy about the intersecting lives of humans and mermaids. Seventeen-year-old Ashlyn spends her time swimming with her best friend Tatiana, and crushing on Tatiana's twin brother Finley. Unbeknownst to Ashlyn, Finley and his family are keeping an ancient secret that they can't share with the humans that they hid among. When Tatiana, Finley, and her family suddenly disappear, it is up to Ashlyn to figure out what happened with their mysterious disappearance. But what she doesn't know is that her friends are deep underwater in Lake Tahoe. Finley's father is on a dangerous mission, which threatens to keep Finley underwater for a long time. But not if Ashlyn has anything to say about it. This is a really interesting young adult fantasy that gives readers an inside glimpse into mermaids and mermen. One of the cool things about this story is that it is told by two different narrators: Ash and Fin. This allows the reader to simultaneously know both sides of the story and experience what it feels like to be the girl stuck on land and the boy stuck under water. Both are very interesting and well-written characters. Ash was kind and caring, growing as a person throughout the novel. Fin was her opposite, headstrong and rash, but mellowed out by the end of the story. The two characters really complemented each other well and readers will love their interconnected stories.